1 of 9 Heat oven to 350 degrees F. Coat bowls with nonstick cooking spray; coat with flour. Place foil liners into muffin-pan indents. 2 of 9 Combine cake mixes, eggs, buttermilk and oil. Beat on low speed until just combined. Increase speed to high; beat until smooth, about 2 minutes. Spoon 2-1/2 cups batter into each of the largest bowls, 1 cup batter into each of the medium bowls and 1/2 cup batter into each of the smallest bowls. Divide remaining batter among the 9 prepared cupcake cups. 3 of 9 Bake at 350 degrees until cake is golden and a toothpick inserted in center comes out clean: about 17 minutes for the cupcakes, 22 to 25 minutes for smallest bowls, 30 minutes for the medium bowls and 40 to 43 minutes for large bowls. Transfer cakes to a wire rack and cool completely. 4 of 9 Meanwhile, place the coconut in a food processor and pulse until finely chopped. Transfer to a medium bowl. Cut fruit leather into a 6-inch and an 8-inch length. Fold each in half, pressing to secure, to get 3-inch and 4-inch lengths. Use scissors to cut fringe on short end of each piece. 5 of 9 Invert cooled bowl cakes onto work surface. Trim flat sides to make level. 6 of 9 Place one of the large bowl cakes, flat-side up, on a platter. Spread top with vanilla frosting. Place the other cake layer on top, flat-side down, to create a ball. Spread a thin layer of the frosting all over cake. Gently press the coconut all over to cover. Repeat with the remaining cakes to make 2 smaller balls. 7 of 9 Place the medium ball on top of the large ball. Insert a trimmed chopstick or wooden skewer for support. Place the 2 pieces of fruit leather as the scarf on top of the middle cake. Add the small ball cake on top. Add more coconut, if necessary. 8 of 9 Cut the orange fruit slice into a 3/4-inch triangle for the nose and attach in the center of the small cake. Add the mini chips, pointed-end in, as the eyes and the mouth. For the hat, attach the 2 cream- filled cookies to the flat chocolate cookie with some of the remaining vanilla frosting. Arrange hat on top of snowman. 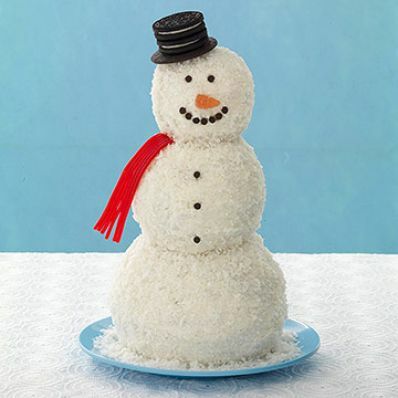 9 of 9 Spread remaining vanilla frosting on top of the cupcakes, sprinkle the tops with the coconut and serve with snowman. Makes 24 servings. Per Serving: 73 mg chol., 463 mg sodium, 8 g sat. fat, 73 g carb., 25 g Fat, total, 2 g fiber, 5 g pro., 530 kcal cal.